Is Refinancing Worth the Trouble? Refinancing can be very beneficial, but it is not always the smart thing to do; the costs associated with refinancing must be balanced against any potential savings. Generally, refinancing a fixed-mortgage makes sense when the interest rate on the current mortgage is at least 2 percentage points higher than the prevailing market rate. In some instances, however, following this “rule” may cost the homeowner a lot of money as a very small percentage point spread may justify refinancing if other factors are present. Closing costs: Possible pre-payment penalties on the old loan, points and fees on the new loan, and attorney fees generally will total 3% to 4% of the loan amount and must generally be paid when the new loan closes. The borrower must consider the loss of earning power of these funds in future income projections. Projected length of ownership: The closing costs can be spread over the period of the loan; therefore, the longer the projected period of ownership, the smaller the spread between the old and new mortgages can be. Loans in excess of certain limits1 – Tax Cuts and Jobs Act of 2017 (TCJA): For 2018 – 2025, mortgage interest on “acquisition” debt on a first and second residence, on total loan amounts of up to $750,000 ($375,000 MFS) is generally deductible; interest on debt in excess of these limits is not deductible. Acquisition debt refers to debt incurred to buy, construct, or substantially improve a qualified residence, and which is secured by a qualified home. This dollar limitation applies to debt incurred after December 15, 2017. 1- The discussion here concerns federal income tax law; state or local law may vary. Loans in excess of certain limits – before 2018 and after 2025: Prior to the TCJA, a taxpayer could generally deduct the interest paid on total acquisition debt on two homes of up to $1,000,000 ($500,000 MFS). Additionally, interest on up to $100,000 ($50,000 MFS) of “home equity” debt could also be deducted. Home equity debt is debt which does not qualify as acquisition debt, but which is secured by a qualified home. Under the TCJA, deductibility of interest on up to $1,000,000 of acquisition debt and up to $100,000 of home equity debt is scheduled to return for 2026 and later years. 1 – Be certain that an annual cap is part of the loan, and carefully examine the index to which the rate is tied. How Many Months Will It Take to Break Even? The real cost of refinancing is the closing costs. Determine how many months it will take to make up these costs from the savings under the new loan. Refinancing an old home loan could mean lower monthly payments and perhaps changing from a variable rate mortgage to a fixed rate mortgage. However, if the projected time in the house is short, the closing costs may consume any potential savings. 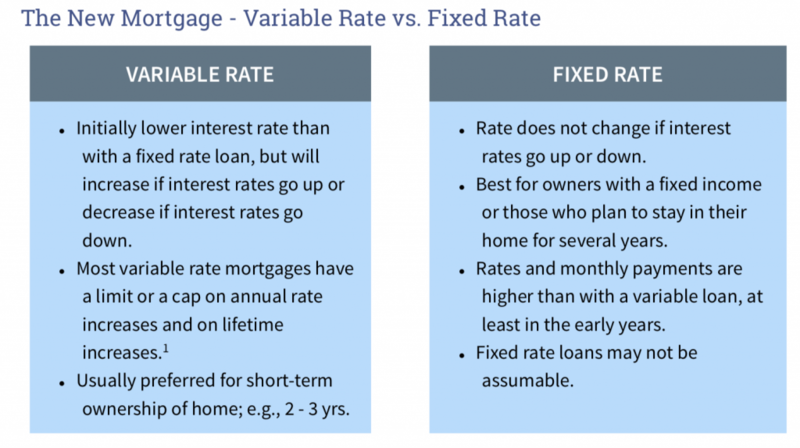 As an additional alternative, if one plans to sell in a year or two, a variable rate mortgage with an initially lower rate may be advantageous.